With a conviction in our hearts to help communities overcome poverty and slavery, we knew we needed to dream BIG. We needed to create a business that could employ over 1,000 people. What type of product did people need? Where production could grow and still remain sustainable? Our founder was already building relationships with people in the Philippines and asked them, "What do you have growing in your backyard?" The answer? COCONUTS. Lots of it! And then we took it a step further... we went to the remote villages, where poverty, unemployment, and trafficking were at an all time high. And through research and training with the local leaders, Dignity Coconuts was established! RAW. Our coconut oil is RAW. And we have a saying around here... "RAW IS BETTER"
Most coconut oil you find in your general grocery store is virgin coconut oil, which is cold-pressed. When we started our coconut company, we planned on using that process too, but we found two problems. We learned that the best olive oils in the world use a centrifuge method, so we tried it. Instead of using pressure and heat, a centrifuge spins the coconut cream to separate the oil from the milk. This gentle method gives the coconut oil a light coconut taste that goes unnoticed in meal creations. Unfortunately, this oil still needs to be dried, so companies use a vacuum dryer to boil out the moisture. 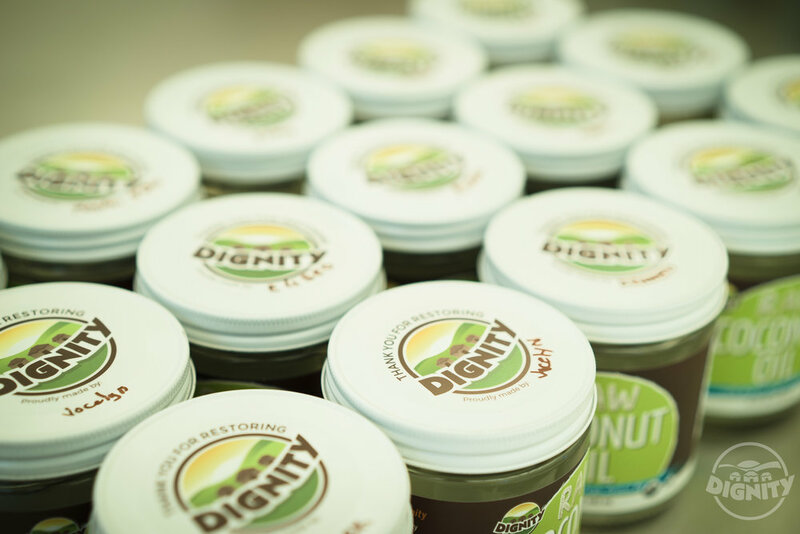 Here at Dignity, we figured out how to get the moisture out without using any heat so you get a truly raw coconut oil, with that light coconut taste and all of its original healthy goodness. Public Service Announcement: The refined coconut oil we mentioned earlier comes from coconuts that lay around getting moldy and buggy. Refineries have to refine out all the gross stuff, bleach out the nasty yellow color and deodorize the stink. Friends don’t let friends use refined coconut oil.